RSS is a really great way to follow some of your favorite web sites and skim headlines to check out specific articles you most want to read. Many Mac users rely on third party apps for subscribing to RSS feeds, but the newest versions of Safari for OS X have an RSS subscription feature built directly into the web browser. Subscribing to RSS feeds this way is simple, and reading feeds is just as easy too, so let’s take a moment to learn how to use it. You’ll need the latest version of Safari on OS X El Capitan or OS X Yosemite to find the RSS subscription option and manager. The feature itself is a piece of cake to use, but it’s a little buried and therefore fairly easy to overlook. That’s all there is to adding RSS feeds to follow in Safari. You can repeat the same process on any website that offers RSS, you’ll find that most blog and news websites offer the subscription service. To access and read your favorite RSS subscriptions, just open the Safari sidebar again, and then go back to the @ tab. The RSS feeds will automatically populate into the sidebar. Clicking on any of the feed items open the feed item into the accompanying browser window (and yes, it expands to the full article if the RSS feed is excerpt only). 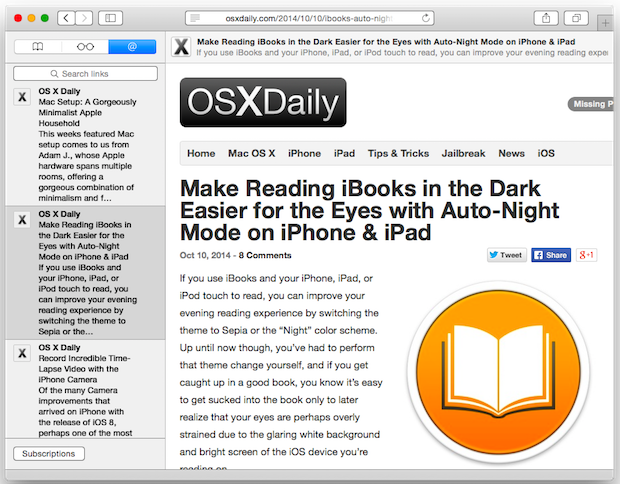 You can also use the Reader function to simplify the appearance of a rendered RSS feed item. 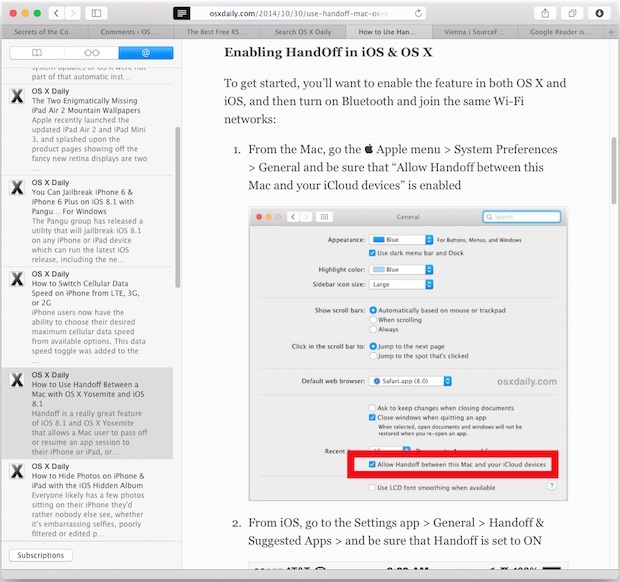 While the Safari RSS feed reader works fine for following a handful of websites, if you’re subscribing to and managing a lot of RSS feeds you’ll likely still want to use a third party app. Two of the best RSS readers in OS X are Vienna and NetNewsWire, try out both and take your pick. This is a really great feature that at the moment is unique to Safari in OS X, let’s hope it comes to iOS soon too. In the meantime for iPhone and iPad users, you can use the Social Shared Links feature in Safari for iOS to serve a similar function. Subscribe to OS X Daily RSS and Follow Us on Twitter! how i file send to Skype and Facebook my complete album in iphoto ? This is an article about subscribing to RSS feeds in Safari. As far as I know, Skype and Facebook do not support RSS and they can not be subscribed to that way. Additionally, iPhoto offers access to Photo Streams of an album, but not RSS either. That is correct, neither Skype nor Facebook support RSS. I get my Twitter meesages on the RSS feed in Safari. Also on iOS this feature works. I read this article, thought to give it a try. I opened up the @ tab and found perhaps fifty different websites listed. I don’t know how they got there. And I don’t know how to get rid of them, either. Control-click brings up nothing useful. Nothing easier! You’ll see a little grey circle with an”x” to the left of each individual feed in your “Subscribed Feeds” list. Just press it to remove the feeds you do not want. Ok. They’re from my Twitter accounts. Any links in a tweet is appearing in the side column. Safari is always slow, too. I wonder if these feeds are clogging things up …? I think ReadKit is the best reader for OS X. It was certainly the first and only (for along time) to support synching after Google Reader shut down. I use Vienna in OS X. I’m typing this comment in Vienna. Is there a way to get an RSS feed to show up in Mail? You could add an RSS feed to Mail using OS X Lion, but now that I’ve upgraded to OS X Yosemite, that feature seems to have disappeared? I have the same question as Janelle. 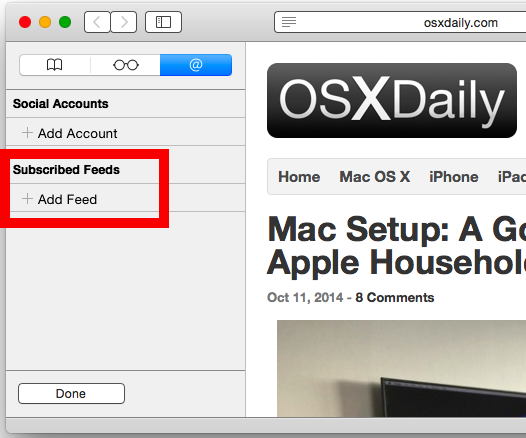 Is there a way to receive RSS feeds in Yosemite’s Apple Mail? Thank you. Look for a “Subscribe to Newsletter” type of link on websites to see if you can do this, but Safari does not allow it by itself. Thanks, Sometimes. The more I research, the more I realize I’m out of luck with the latest software. 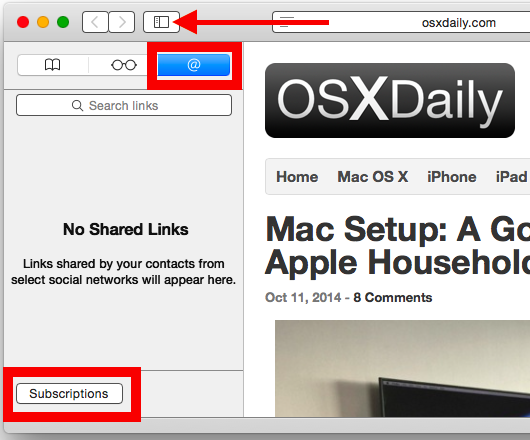 RSS feed subscriptions are back in Safari with Yosemite. Seems we have to look in Shared Links, period, as there’s never a mention of viewing through Mail. This (more than) frustrated me as well. I had RSS feeds set up in Mail and they’re all just gone with my new laptop running Yosemite. I tried adding your OS X Daily RSS to my Shared Links, but after clicking on Add Feed the Subscribe To field does not auto-fill. How do I add a feed when that field is empty? The blog that I want to follow is in my favorites, but is not listed on the drop down of Favorite Feeds. What am I doing wrong? Thank you. Try doing it from within a post rather than the homepage. RSS feeds are maintained on the website server you are pulling the RSS feed from, you can not modify a website or servers RSS feed, but when you read one locally it marks it as read in Safari. Hello, is there a way to sort subscriptions (Feeds) by date in Safari 9? Now they seem to be sorted alphabetically by each subscribed Feed. this? suppose you composed a catchier post title? I ain’t suggesting your information isn’t solid., however suppose you added a headline that makes people desire more? I mean Subscribe to RSS Feeds in Safari for Mac in OS X El Capitan & Yosemite is kinda boring. to say. Just my opinion, it might bring your posts a little livelier. OMG. That’s where my RSS feeds went after I upgraded! Now I have several months of updates to catch up with! Good analysis . I was fascinated by the information , Does someone know if I could find a sample a form document to edit ?